V. J. Kalkman & A. G. Orr. Field Guide to the damselflies of New Guinea. Date of release was July 5. This field guide contains nearly 300 colour drawings and over 250 line drawings by Albert Orr and sixteen colour photographs taken in the field by Stephen Richards. New Guinea is one of the least studied regions of the world. Most species and numerous genera are found nowhere else, particularly among the Zygoptera or damselflies. Over 500 copies of the field guide will be donated to universities throughout New Guinea. 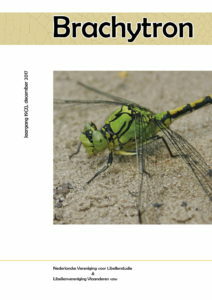 We hope that these books become dog-eared with use, as students and local researchers take them to the field and through them learn to appreciate the beauty of damselflies, to study their biology and use them in biodiversity studies supporting the conservation of freshwater habitats on their island. 10-09-2013: The Field Guide to the Damselflies of New Guinea by Vincent Kalkman and Albert Orr and illustrated by Albert Orr has won the Whitley Medal for 2013. The Presentation Ceremony is held on 11th October at the Australian Museum.